Sometimes I just think funny things: and this one time? at band camp? and this one time? at band camp? 4) finding old pictures and lamenting that anyone around you knew how to work a camera. At the moment I'm in the "finding old pictures" stage (though the first four stages are ongoing), and while I've enjoying seeing old shots of my family and friends, I can't help but think, Why On Earth Didn't My Mother Intervene or at the Very Least Find Me a Large Rock To Hide Under? Holly started a new feature in her blog entitled Bad Decision Tuesday, and though I can't promise Tuesdays or even any specific day of the week, I will periodically be sharing humiliating photos for your viewing pleasure. You're welcome. I'm not sure if you knew I was a Liza Minnelli impersonator in my youth, but isn't this all about getting to know each other one frightening bit at a time? The only thing that makes me wistful for this time is my waist size and pronounced cheekbones. Otherwise, this is just a horrible, horrible car wreck of a moment captured in time. 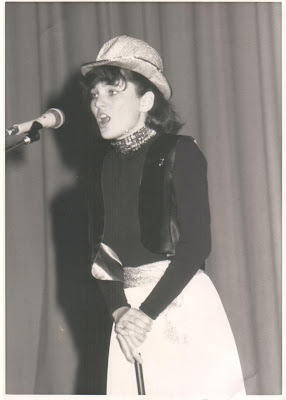 What little I remember about this particular performance is that I was singing 'New York, New York' and I think this was actually at a daytime assembly, and not a night-time performance. In essence, I was so White-Hot, they saved me for a matinee. But not just any matinee. A matinee in front of the entire high school. I'm guessing I was pretty tickled with myself. This, in a nutshell, goes a long way toward explaining those hundreds of dates I had with cute lacrosse players and college guys. Music and theatre gave me lifelong gifts: an appreciation for the arts, a creative outlet, loads of great memories hanging out with talented people. I'm also left with the gift that keeps on giving: pictures of me with black eyeliner, satin vests, and glittery hats. I'm going shopping for some spanx now. Maybe I can find some black satin ones, edged with glitter. Just for old times' sake.